DISSIDENT (AUS) (Bay or Brown 2010-Stud 2015). Horse of the Year in Australia in 2014-15. 7 wins-1 at 2-from 1000m to 1600m, A$2,021,200, ATC All Aged S., Gr.1, Randwick Guineas, Gr.1, VRC Makybe Diva S., Gr.1, MRC Memsie S., Gr.1, CF Orr S., Gr.1, ATC Hobartville S., Gr.2, 2d ATC Golden Rose S., Gr.1. Out of SP Diana’s Secret. Sire of SP Challa and of Louis Luck, Outlandos and of the placegetters Bigboyroy, Disruptor, Just Cosmos, Kallie, Shake That Tush, etc. His oldest progeny are 2YOs. MIHALIC (f. by Hard Spun). 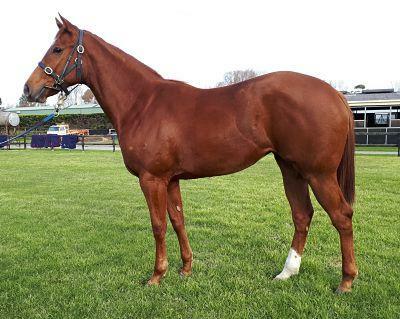 Winner at 2, A$114,400, VRC Maribyrnong Trial S., L, 2d MRC Twilight Glow S., L.
Dragon Knight (g. by Niello). Winner at 1200m in Malaysia, 3d Perak TC Malaysia 3YO Championship Heat 1. Patriot (g. by Reward for Effort). 4 wins to 1250m, A$79,690, to 2018-19 in Aust. Lady Spitfire (f. by Bel Esprit). Winner at 1400m in Aust. Cerro Vista (f. by Statue of Liberty). Placed at 3 in Aust. SERTORIUS (Galileo). 10 wins from 1200m to 2400m, A$1,282,922, MRC Zipping Classic, Gr.2, Easter Cup, Gr.3, Bendigo Cup, L, Sale Cup, VRC Antler Luggage H., MRC Bluecross Community & Residential Services H., MVRC Sportingbet H., 2d MRC Futurity S., Gr.1, VRC Blamey S., Gr.2, Queen Elizabeth S., Gr.3, MRC Victoria H., Gr.3, Cranbourne Cup, L, Kyneton Cup, MVRC Jeep Don't Hold Back H., 3d ATC Sydney Cup, Gr.1, VRC Blamey S., Gr.2, MRC Carsales.com.au H., 4th ATC BMW S., Gr.1, Chairman's H., Gr.2, MRC Zipping Classic, Gr.2. DOLLAR FOR DOLLAR (High Chaparral). 8 wins from 1200m to 1600m, A$501,045, to 2018-19, MRC Sandown S., Gr.3, SAJC Spring S., Gr.3, VRC Lavazza Short Black H., SAJC Spring Carnival H., AAMI Lucky Club H., Ballarat TC Suez McKellar Mile H., 2d MRC Sir Rupert Clarke S., Gr.1, VRC Sofitel H., L, MRC John Dillon S., L, 3d VRC Chester Manifold S., L.
CLIFTON RED (Sebring). Winner at 2, A$130,000, VRC Thoroughbred Breeders S., Gr.3, 4th ATC Royal Randwick S., Gr.3. Rezealient (Sebring). Winner at 2050m, A$207,180, in 2017-18, 2d South Australian Derby, Gr.1, VRC St Leger, L, MRC Galilee Series Final H., L.
I Am Titanium (Flying Spur). Winner at 1200m, A$140,430, 2d VRC Poseidon S., L, MRC Abbie Fennessy Memorial 2YO P., 3d MRC Story Landscaping H., Superior Food Services H., National Apprentice Riders H., 4th MRC Chairman's S., L, SAJC Adelaide Guineas, L.
Spoils (Snitzel). Placed at 2, 2d MRC Debutant S., L, SAJC Cinderella S., L, 3d MRC Chairman's S., Gr.3, SAJC Magic Millions Adelaide 2YO Classic, 4th MRC Blue Diamond Preview (f), Gr.3. Interram. Winner at 1200m in 2018-19, 3d MVRC Quest Moonee Valley H.
King's Hero (Aus). 2 wins at 1400m, 1600m in Aust. Cherubini. Winner at 1200m in Aust. Miss Manis. Winner at 1500m in Aust. Rose of Rancho. Winner at 1000m in Aust. Professor Piccard (Deep Diver). 5 wins-1 at 2-to 1300m, WATC National Trust Cup, Bandolier H., Fairway Graduation S., Ocean Graduation S., 3d WATC Hyperion S., Gr.3, 4th VATC Merson Cooper S., Gr.3. Water Show. 4 wins-2 at 2-to 1200m, VATC Wiggle H., MVRC Lyndhurst H., 2d MVRC New Tarago H., VATC Glenhuntly H., Sweet Nell H., 3d VATC How Now H. Producer. TONTONAN (Showdown). Head of The 1973-74 Aust. 3YO & 1972-73 Aust. 2YO (joint) Free Hs. 12 wins-4 at 2-from 1100m to 1600m, A$241,900, STC Golden Slipper S., Gr.1, AJC Doncaster H., Gr.1, Sires' Produce S., Gr.1, All-Aged S., Gr.1, VATC Oakleigh P., Gr.1, VRC Craiglee S., Gr.2, MVRC John F Feehan S., Gr.2, VATC Chirnside S., Gr.2, BATC JT Delaney H., Gr.3, STC Ajax S., L, VRC March Nursery H., VATC Trenton S., 2d VATC Marlboro Cup, Gr.2, 3d STC Todman Slipper Trial S., Gr.3. PRODROMUS (Showdown). 4 wins-3 at 2-to 1400m, VRC Maribyrnong Trial S., L, VATC Glenhuntly H., Glenferrie H.
Timetheus (Showdown). 15 wins-2 at 2-to 1200m, VRC Moomba H., Myross H., 3d VRC Ascot Vale S., Gr.2. STARCLOSURE (Star Shower). 6 wins-1 at 2-to 1350m, SAJC Christmas H., Gr.3, VRC Maribyrnong Trial S., L, SAJC Boral Cyclone H., West End Light H. Sire. STRAIT FROM ABOVE - SPEED MASTER (Mac.) (Straight Strike). 5 wins-2 at 2-at 1200m, 1400m in NZ and Macau, Foxton RC Castletown S., L, Marton JC Marton Hotel 2YO H.
MOATIZE (Danehill Dancer). 2 wins at 1400m, 2500m, A$605,530, VRC Saab H., Gr.3, 3d VRC Australian Cup, Gr.1, STC Ranvet S., Gr.1, Queensland Derby, Gr.1. BELTROIS (Bel Esprit). 6 wins to 1200m, A$397,185, MRC LT Cleary S., L, 2d VRC Standish H., Gr.3. Near Show (Showdown). Winner at 1200m, 3d VRC Tetley Tea Bag S.H., L. Sire.